Nice weather smiles down on heavily attended "Weathering Heights"
A warm, calm night smiled upon “Weathering Heights” Monday. Last February brought some late month “thunder sleet.” So perhaps someone up there liked your friendly content provider just enough to keep any and all storms at bay. A full house of about 125 answered the call, matching the turnout for last September’s Press Club of Dallas-sponsored sendoff to WFAA8 investigative reporter Byron Harris. But this was a paying crowd, which makes it all the more impressive. The admission price of $20 included wine, beer, soft drinks, food and a copy of Hugh Aynesworth’s book November 22, 1963: Witness to History, which he happily signed. Plus, a $500 donation from ticket sales went to the American Red Cross of North Texas for tornado relief efforts. Press Club president Frank Librio presented the check on site to a Red Cross representative. Among the attendees were former CBS11 sports anchor Babe Laufenberg; ex-NBC5/CBS11 traffic reporter Tammy Dombeck; former WFAA8 traffic anchors Mike Shannon and Shane Allen (newly hired as assignments editor in the CBS11 news room); ex-Fox4 reporter Rebecca Aguilar and co-anchor Ron Corning of WFAA8’s Daybreak. Moderated by former WFAA8 anchor Gloria Campos, who retired two years ago after 30 years with the station, the panel of trailblazing weathercasters was headed by meteorologist David Finfrock, now in his 41st year at NBC5 with at least two more years to go before he tentatively retires at age 65. Finfrock was hired in 1975 by the late, legendary Harold Taft, a no-nonsense stickler for detail who for years prohibited extended forecasts because he didn’t believe the science supported them. In the early years, teacher and pupil used to draw some of their maps in crayon, Finfrock recalled. 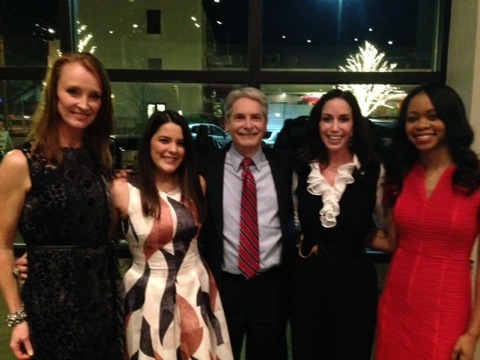 Finfrock’s career spans those of all four women who joined him onstage at the 3015 At Trinity Groves event center. Jocelyn White is closest to his vintage. Early in 1981, she stepped in as D-FW’s first ever weekday 6 and 10 p.m. weathercaster after KDFW-TV’s (Channel 4) head forecaster, Wayne Shattuck, suffered serious injuries in an Arizona car accident. Her history-making tenure lasted six months. But White said she was under no illusions after becoming one of just five women in the country at that time to earn the American Meteorological Society’s Seal of Approval. “The reason I quit doing the weather (she left Ch. 4 in 1984) is I was told there would never be a full-time woman chief meteorologist” at Channel 4, she said. And there still hasn’t been. Kristine Kahanek spent four years on the morning shift at WFAA8 before joining CBS11 in the fall of 2002 as D-FW’s first woman chief meteorologist. This wasn’t by happenstance and it hasn’t happened again. Although Fox4, NBC5, WFAA8 and CBS11 all have at least one woman meteorologist on their news staffs, Kahanek remains the only woman specifically hired to head the weather team. She left CBS11 in the spring of 2009 and was replaced by current chief meteorologist Larry Mowry. Remeisha Shade, who joined NBC5 in December 2010, is D-FW’s first African-American woman weathercaster with a full Bachelor of Science degree in meteorology. And Milmar Ramirez, Telemundo39’s weekend forecaster for the past year, is that station’s first fully accredited woman meteorologist. She earned her degree from the University of Miami and spent a short time at D-FW’s Univision23 before changing stations. Both Shade and Ramirez remembered first being starry-eyed about the weather as pre-teens. Shade already had a weather-ready surname and also found that she liked being on stage or in front of a camera. While earning her meteorology degree, she also was crowned Miss Florida State University and competed in the 2003 Miss Florida pageant. Kahanek wrote children’s books after leaving CBS11 but now has taken an entirely different career turn. She’s currently working as a staff nurse in the Cook Children’s Medical Center’s emergency room and hopes to graduate from Maryville University in 2017 as a Family Nurse Practitioner. White remains on television as the host of Designing Texas, which airs the third Sunday of every month on WFAA8. The longtime animal lover also helms the syndicated Pawsitively Texas show. Shade is hopeful. “We’ll see what happens. I am open to promotion,” she said diplomatically -- and with a smile.